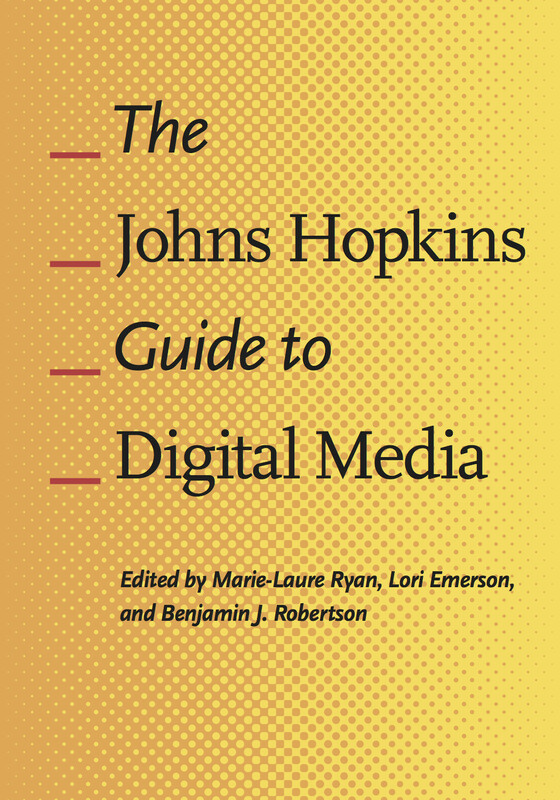 The recently published "Johns Hopkins Guide to Digital Media", weighing in at over five hundred pages, claims to be the first "systematic and comprehensive" reference work on digital media. However, the reader need only scan the table of contents with entries ranging from the expected, such as "Blogs," to the obscure such as "Searle's Chinese Rooms," to appreciate that it is neither systematic nor comprehensive. And, this is not necessarily a bad thing. For, The Guide does indeed accomplish what it sets out to do: provide readers with " a GPS and a map of the territory of digital media, so that they will be able to design their own journey through this vast field of discovery." I asked the editors, Marie-Laure Ryan, Lori Emerson, and Benjamin J. Robertson, how they went about selecting contributors and topics. Digital technology is a global phenomenon. For better and for worse, however, we had to work within the constraints of our own knowledge and academic circles. It was actually very difficult to find writers for some of these entries and we spent a considerable amount of time searching (via Google, Google Scholar, and other search engines) for people who could write for us. All of us wanted to include women and people of color whenever possible, and not simply for entries that have to do with gender or race. At the same time, we think the even distribution of men and women writers in our encyclopedia happened somewhat fortuitously. We tended to seek out people we knew who worked on certain topics and relied on our search skills to identify other writers. In some cases, as with Olga Goriunova on "Social Network Sites", other writers suggested women they knew working on a certain topic. As for which entries we included, we started with a list Marie-Laure had created and worked from there. We decided early on to not include technical subjects because we would have trouble finding qualified writers in the humanities, and because including them would make the volume far too large. From there we looked for writers who modified article titles and scope and suggested new ones. "Search" and "Data" were included because of suggestions made by writers. "Platform" wound up in there based on our reader report from the (John Hopkins University) press. The editors seem to have given the well over a hundred contributors relatively free reign in terms of choice of topic and length of essay (essays range from half a page to several pages.) This is an excellent decision as many contributors are not only experts in their fields often they are also practitioners. Thus, we have Emily Short writing "Interactive Fiction," Christy Dena writing "Transmedial Fiction" and Eduardo Kac writing "Biopoetry." The result is that The Guide is like having a local show you around. Not only you get to see many of the big sights, but also the lesser, quirkier ones that only a native would know. Blessedly free of academic-speak, The Guide provides even the lay reader with a continual impetus to explore. Topics that, at first glance, might seem dry and uninteresting, turn out to be fascinating explorations of critical concepts. "Algorithm" by Bethany Nowviskie is one such example. In reading it, I learned about Kurt Godel's "Incompleteness Theorems" as well as Peter Suber's rule-changing game "Nomic." Not only do entries frequently reference specific new media art works, they also cross-reference other entries in The Guide, and each ends with references and suggestions for further reading, many of which are available online. It is likely that many readers will peruse The Guide as I did with open laptops so they can look up links. This brings up the obvious question. Why in the world is a guide to digital media published as a conventional book? Is it because, as the "Johns Hopkins" in the title suggests, for as much as the move to the digital has altered and expanded the opportunities for curating and distributing knowledge, authority is still connoted by institutions (publishing houses and universities) and the physical object of the book? I asked the editors about this. It's absolutely true that there is a certain prestige (warranted or not) that comes with publishing a codex book. None of the editors here are tenured and it's likely that publishing a "mere" e-book without the physical volume would not carry with it as many accolades. But there are, I think, other advantages to the physical book. First, the book allows for a certain random access not available with any ebook format I know. That seems to be a valuable thing, especially for a guide such as this that includes so many disparate articles. Second, academics (again rightly or wrongly) in many instances still think with books. One sits a certain way while reading from a codex rather than a laptop. One can underline. One is put in a certain mood that may not be available with an e-reader. I would also suggest that the decision to publish The Guide as a book does not merely fulfill commercial and cultural demands, it forces the reader to consider old media through the lens of the new. As Jessica Pressman notes in her essay "Old Media/New Media," "the designation of 'newness' indexes an act of mediation and a shift in perspective from a previous cultural norm. It thus invites investigation into how culture operates and (is) operated." The awkwardness of lugging this tome around, balancing a computer on one's lap, and taking the time to switch between the two forms of media, creates a mechanism by which the process of reading about new media forces the reader to refer back to the process of reading in old media. The physical labor of reading and the choices of what to pursue and what to ignore which the digital tends to efface is revealed in the act of reading The Guide. Diderot's Encyclopedia(1751), a multi-contributor Enlightenment project, which aimed to incorporate all of the world's knowledge and disseminate it to the public and future generations, has perhaps been realized in the World-Wide Web. The editors of The Guide acknowledge this contribution. The preface explicitly references Wikipedia, and contrasts the anonymity of those entries with the named contributors of The Guide. By naming contributors, (interestingly, Diderot's Encyclopedia also did), the editors hope that the writers will be persuaded to produce something worthy of their own legacies. As with a conventional encyclopedia, topics in The Guide are arranged alphabetically. Not only is this a practical way to organize the wide-ranging content, by coding the knowledge in this conventional way, the editors point out The Guide's inevitable "failure" as a source of complete information and as an object that is inevitably bound for some degree of obsolescence. In the digital realm of information production, distribution, and collection, Diderot's notion of a complete, timeless reference is as anachronistic as, well, a book. Like the conventional notion of "the book," the notion of "the human" is also in flux. As Raine Koskimaa suggests in his essay, "Cyborg and Posthuman," because of our "immersion" in new systems of communication and information transfer, our increasing reliance on technological biological enhancement, and altered construction of subjectivity, the question now is "in which sort of posthuman or cyborg constructions we partake." It is this crucial question that The Johns Hopkins Guide to Digital Media, adroitly and enjoyably, offers readers the chance to contemplate.